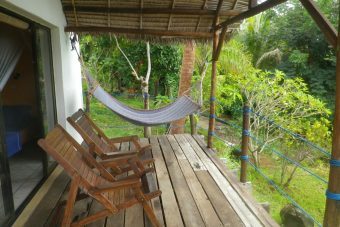 For all comfort Bungalows sea view, Family villa - for hikers Bungalows garden view. 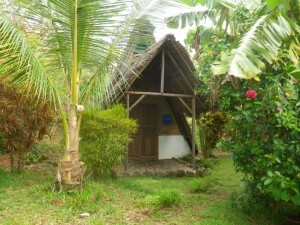 Bungalows comfort, all sea view between 59 and 104 € (Clim. Optional), bungalows hikers from 37 € with simple sanitary, card 'snacks' lunch and dinner with a menu and breakfast at 22 €. The hotel is located on a promontory overlooking the sea and the Islands in front, superbly, to always obtain a light nice wind in the shade, rather than the great Sun of beach. This natural fan embraces one of the most beautiful bays of the island of perfumes : Certainly the most beautiful view ! A small path takes you to the beach in 5 to 10 minutes through lush vegetation. One of our favourite addresses. 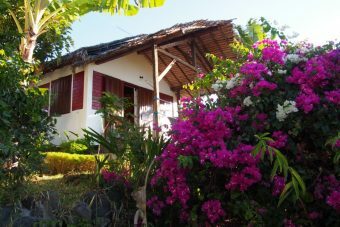 Comfortable bungalows equipped with Malagasy furniture, thatched roof, private terrace with hammock, electricity, the hot water and the FREE WIFI, all 24 h/24, NET and air conditioning (pay option). An exquisite and subtle sense of tranquility with breathtaking views facing the islands of Nosy-Fanihya and Nosy Sakatia. Great also with its nice infinity pool in the continuation of the salons with a breathtaking view on the Bay of the peninsula ofANDILANA. 10 Bungalows comforts beautifully decorated, spacious (25 m²) and comfortable. SEA VIEWS. 1 double wide bed. 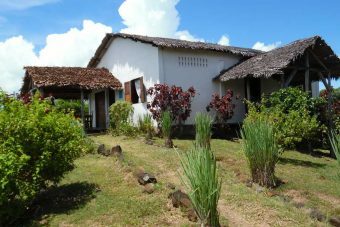 4 Very spacious comforts family bungalows (40 m²) for 5 people, SEA VIEWS. 2 rooms separated by a door or curtain.